I had hoped that the snow would melt with the warmer temperatures yesterday, but sadly that did not happen. The snow remains covering much of the ground. But at least we are in the midst of a heat wave! It was 21 degrees this morning as I awoke with the promise of possibly seeing 46 degrees! Today is the special Sunday that arrives but once per year. Of the 52 Sundays that comprise a year, this day has been designated as Super Sunday because of the Super Bowl! It is the crowning of the NFL Champion after a grueling season the 32 teams have been whittled down to 2 contenders to be crowned Champions! Many other American professional sports, for instance basketball, hockey, baseball; play a best of seven series to determine the league champion and so there is not the hype and drama that is associated with football's one game winner-take-all format. We do not have to wait out a grueling series to determine the eventual champion. 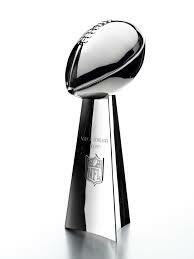 Tonight the Lombardi Trophy signifying the NFL champion will be awarded to the final survivor. So, here is my prediction for the big game: Patriots 35 to Rams 31.